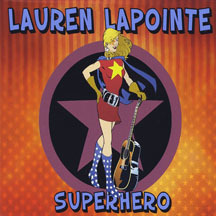 I must admit that I had not heard of Lauren Lapointe before I came across this, her latest album [called "Superhero"]. However, I was so impressed after one listen to it that I resolved to find out more about her. I discovered that Lauren, who is based in Savannah, Georgia, has made two previous albums, "Beautiful Shadow"  and "Butterfly".After the release of "Butterfly" she became interested in Country music after finding a 1971 Gibson Hummingbird guitar , as used by the late Gram Parsons and his protégée Emmylou Harris, in a vintage music store. Lauren says that this guitar inspired her to write the songs on this album and that "I have this theory that these songs had been trapped in the guitar and I was simply setting them free". In fact, Lauren wrote all of the songs on the album, although two of them were co-writes with fellow Savannah songwriter Taylor Martin. The album was produced by renowned Nashville producer Thomm Jutz at his studio TJ Tunes situated on a quiet rural road twenty five minutes from downtown Nashville. Thomm is an accomplished guitarist who moved to Nashville from his native Germany in 2003 and has since worked with a host of established names including David Olney, Mary Gauthier, Nanci Griffith, Steve Young and Kim Richey, to name but a few. Lynn Williams on drums [Delbert McClinton]; Gary Smith on keyboards [John Anderson] and last, but not least, Terry Crisp on pedal steel [Reba McIntyre, Joe Diffie]. The production and playing on this album are first class, so does Lauren's songwriting match up to this? The answer is a resounding "Yes". Lauren is an excellent lyricist, as is apparent from the very first track "Silent Hurricane", which shows her talent through lines like "You're like a cold,cold sun, You're like a dry, dry rain, You're nothing that you seem to be,You are a silent hurricane". The title song "Superhero" is an upbeat, uptempo and uplifting song about discovering hidden talents within yourself. In Lauren's words " Superhero is the perfect title for the CD since many of these songs were written from a place of discovery of my own strength as a songwriter, singer, musician and person". Indeed this theme permeates the following song "Silver Cowboy Boots", which relates the story of Emmylou Harris and how she emerged as a solo artist following the demise of her duet partner Gram Parsons. It's a moving story, to which added poignancy is given by Terry Crisp's chiming pedal steel. In contrast to the pure country of the last track, "I Believe" is a bluesy number in which Lauren tells us that she believes "You've got to follow your heart". This track features sterling work by Gary Smith on piano and organ. From country and blues we move to Celtic folk for "Scotland Tonight", which was written by Lauren about a trip North of the Border. Justin Moses really shines on fiddle and dobro on this haunting track. It's back to a classic country music sound for "Dusty Tired Angel", which again features Terry Crisp's ringing pedal steel and some nifty piano from Gary Smith. This excellent song was co-written with Taylor Martin, as was the following "Rattlesnake Mountain Road", a country-gospel number which Lauren sings a cappella, thus demonstrating her considerable vocal talents. To add further variety, "The Ghost of Elvis" ventures into rockabilly territory, albeit with a banjo in tow. In this song, the ghost of "The King" appears to one of his fans whist she is lying on his grave! No Americana album would be complete without a bluegrass track and this is no exception. "When The Wind Blows" is a superb example of the style, featuring some great playing by Justin Moses on fiddle and banjo. The closing track "If All The Flowers Were The Same" is a lovely song about embracing diversity by contrasting the different qualities of various types of flowers. It is beautifully sung by Lauren, accompanied by Thomm's delicate acoustic guitar. As Steve Young put it "Lauren Lapointe is a great talent". It seems hard to believe that someone so talented is not signed to a major label. This is an excellent album by a gifted songwriter and I hope that Lauren gets the break she clearly deserves.